I believe the name of this lake might be Llyn trwyr Coed (Ref. Google Earth image). This image is stitched together from three originals. 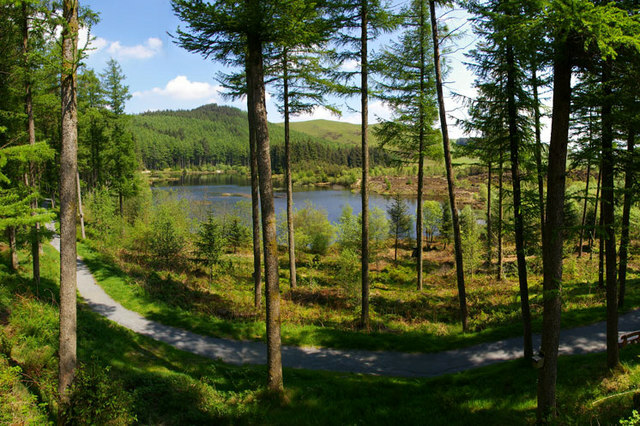 Bwlch Nant Yr Arian Visitor Centre is located on the A44 between Aberystwyth and Llangurig. Red Kite feeding can be enjoyed every day at 3pm(2pm winter), offering spectacular views of the birds in a wild and wonderful setting. Two scenic waymarked walks with breathtaking views begin at the Visitor Centre, as does the All Ability Lakeside Trail giving everyone the opportunity to enjoy the natural beauty of the area. The centre also has three single track mountain bike routes offering epic rides for the more adventurous, and two waymarked horse routes.